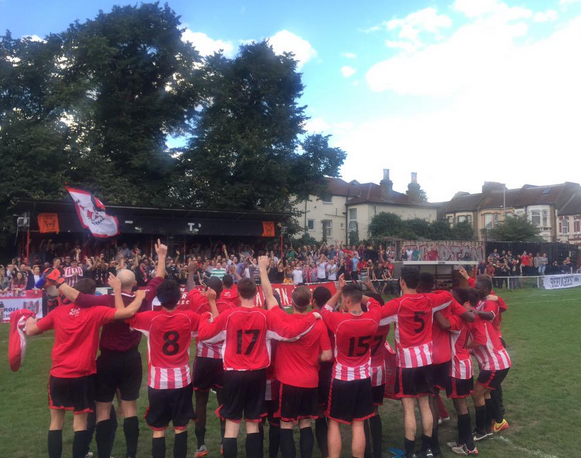 To this end, Clapton fans have set up the Clapton Supporters Action Fund, to raise money for the legal battle to wrest control from the current owners as well as help transform the club in the longer term. Even now, though excluded from the club's official resources, the supporters have in the last year alone organised numerous food bank collections for the Newham Refugee and Migrant Project, participated twice in the national 'Football vs Homophobia' initiative and organised a 'Proudly East London' anti-racist football tournament. 1. For those who don’t know, tell us a little bit about Clapton FC. Clapton was founded in 1877 in Hackney Downs, Clapton as ‘Downs FC’ and moved to its current ground in 1877. It’s a club with great amateur history winning the FA Amateur Cup on five occasions, providing international players at both amateur and full level and being recognised by the Football Association as the first English team to play in Europe. Equally the club has produced players who have made their mark in the professional game, most notably Walter Tull who was the first black professional outfield player, Clyde Purnell, a Olympic Gold medallist and, more recently Gary Charles who played for Nottingham Forest and gained full England caps. Thus it can be rightly said that Clapton FC were one of the pioneers of the sport of association football. In recent years, the non-existence of a club membership and rejection of application to join the club saw the formation of Friends of Clapton, a group of supporters who wanted to join and help the club. Shortly afterwards in 2012, the Clapton Ultras formed by a group of friends that grew disillusioned with their league clubs, not just being priced out but with the prevailing culture that turns a blind eye to sexism, homophobia, transphobia and racism. In 2014, following a mandate from the three surviving life members of Clapton FC, the Friends of Clapton re-established the club, the real Clapton Football Club. 2. What is the Clapton Supporters Action Fund? 3. What do you envision a fan-owned Clapton would be like? Well, this is the exciting thing. The current regime isn’t really doing anything so the possibilities are endless. Firstly it would be democratic, with each member getting one vote on big decision in the club. Through this can make begin work on a number of things that are often discussed by fans, so the pitch which is a right state would surely have some investment for improvement. We can work on improving the other facilities for the players like the showers. For the fans we can create an assessable ground for all. So that would involve some groundwork around the pitch for those that use wheelchair or other walking aids and of course accessible toilets. In regards benefits to the community, this is the main driving force for many involved in the Clapton Supporters Fund. We would like to see Clapton firmly bedded in the community. The frustration with the club is that they don’t do anything. We have 3 youth teams which are essentially franchised out. I’d like to think that this is something we would change; we would be looking at many youth teams for boys and girls. It would also be great for a women’s team to be playing at the Old Spotted Dog and to see more initiatives from the club to encourage more marginalised groups in to the club, which we have seen from the supporters. However, as fans we have limited impact as we can’t give discounts or make sure that everything at the club is suitable. Clapton can build on the good work the Clapton Ultras have done like food banks, anti-discrimination football tournaments, LGBT solidarity and kids clubs. Furthermore, being fan owned will bring love and attention to a club that is not appreciated, neglected and uncared for. Anyone that has been to the ground can see the work carried out is at the bare minimum which is unacceptable. 4. How does the struggle at Clapton relate to other struggles going on in modern football, particularly at the other end of the football pyramid? Do you think fan-ownership could be a solution/counter-weight to these problems? To be honest it seems the genie is out of the bottle with many premiership clubs. I read that if all the stadia were empty next season with no one buying a ticket, the clubs would still make more money than they did this season. This implies that spectator fan power is diminishing as they are no longer a needed source of income. People only start protesting at £77 for a game? There has been a growth in fan owned clubs but this is usually as a phoenix club or when a club has been on the brink of going out of business. It appears that for the bigger clubs its simply too big for fans to buy outright, so many fans have left or formed protest clubs like FC United (although I’m sure would no longer wish to be referred as a protest club). It’s no secret that non-league clubs around Clapton with proud history have merged/bought out to other clubs or gone bust, like Walthamstow Avenue and Leyton FC. It appears that the clubs need the fans and working class people need games that are affordable. If you add that to what a club, such as Clapton could offer its community, the prospects are very exciting indeed. The main asset is the ground which was secured with a 100 year lease, long before Mr McBean arrived. Unfortunately, since his arrival, the management of the ground has been less about community and more about personal gain, an example of which was Mr McBean’s attempted sale of the lease in 2008. The Clapton Supporters Action Fund offers an opportunity to take the Clapton Football Cub back and re-open it to all. The continuance of this historic amateur football club, who have played in the Borough for over 125 years and its recognition as such by local people are the perfect companions to the establishment of multi-usage of the facilities for the use and enjoyment of all members of the community. This will not be achieved whilst Mr McBean continues to hold sway. If you want to donate to the Clapton Supporters Action Fund, check out their fundraising page and contribute there. If you fancy heading to a game, check out the fixture list. And if you like what you see, you can always join the Real Clapton Football Club. 1. For a more in-depth look at how Vince McBean took over Clapton, see here.